Small localized areas in wood with the fibers indented and otherwise contorted to form few to many small circular or elliptical figures remotely resembling birds' eyes on the tangential surface. Sometimes found in sugar maple and used for decorative purposes; rare in other hardwood species. 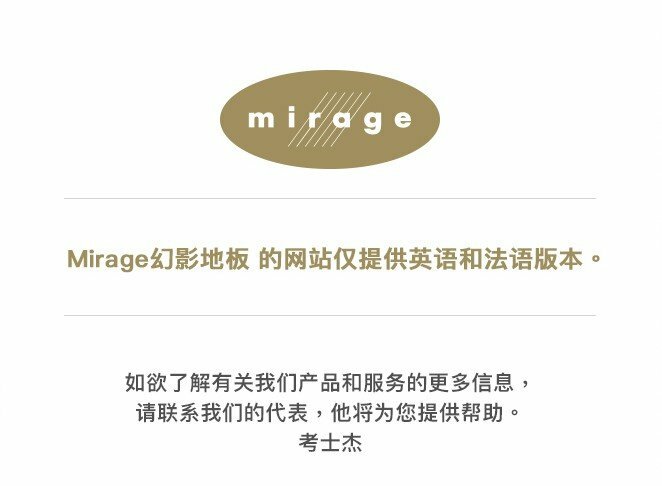 Mirage's name for its grade of wood with unlimited natural characteristics as pronounced color variation, open and closed knots, mineral streaks, cracks, surface holes, and other character or milling marks. The Character grade offers wood as found in nature. Also see Grade. 3/4" (19 mm) thick solid prefinished hardwood flooring. Mirage Classic flooring is designed to be nailed or stapled down over a wood subfloor. It is important to distinguish between wood's natural coloring and variations caused by external factors. Each species has its own grain, and thus its own typical coloring. In the same block of wood, color varies according to the density of the fibers. This is what creates wood's unique pattern. Various natural factors can alter wood's coloring, such as exposure to light, air, and humidity. The color can be changed with stains and varnishes. The effect will vary in intensity depending on the density of the fibers and the degree to which they absorb the stains and varnish. We distinguish between floors installed for commercial and residential use, especially for the warranty. A location is considered commercial if it is open to the public or is a place of work. A residential location is one where people live. In commercial locations, floors are subjected to heavier traffic. Mirage offers a collection of commercial-use floors called Mirage NanolinxTM Commercial. A cok-like texture delivers distinctive depth. Wood in which the fibers are distorted so that they have a curled appearance. The areas showing curly grain may vary up to several inches in diameter. A method of precision sawing hardwood to the desired strip thickness without having to presoften the wood by soaking. The place where two hardwood boards are joined together end to end. 5/32'' (4mm) of real wood over a 7/32'' (6 mm) or 11/32'' (9 mm) hardwood plywood base. Available in 2 9/16 (65 mm), 3 5/16 (84 mm), 5'' (27 mm), 6-1/2 in (165mm) or 7-3/4 in (197mm) wide planks. Every box contains 6 different boards lengths. 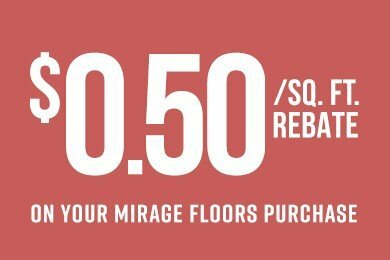 Mirage Engineered products are designed to be glued onto concrete or can be stapled onto a wooden subfloor. This floor cannot be floated. Engineered wood (Mirage Engineered) is composed of a hardwood surface glued to a plywood base. Mirage's name for its grade of wood with some pronounced and nuanced color. The Exclusive grade offers a limited range of color variation. Also see Grade. Wood imported from countries with climates different from that in North America are considered exotic. For example, Santos Mahogany (Cabreuva), Brazilian Cherry (Jatoba) and Sapele are exotic species, whereas Maple and Oak are indigenous. The space necessary in certain places to allow for movement due to moisture variations. Formaldehyde is a volatile organic compound made of carbon, hydrogen, and oxygen. At room temperature, it is released as a gas by many products (detergents, industrial adhesives, tobacco smoke, textiles, etc.). A medium gloss level will bring out the beauty of hardwood floors. A matte surface gives the look of an oiled floor, but without the maintenance. Wood strips are categorized according to variations in their natural coloring. "Grade" refers to visual aspect only and has absolutely no bearing on quality. See Grade for examples. In wood strips with a tongue and groove joint, a tongue is milled on one edge of the strip and a groove is cut into the opposite edge. The form of the joint is also referred to as male (tongue) or female (groove). When the flooring is installed, the tongue of each strip is inserted into the groove of the adjacent strip. The wood's resistance to impact. Hardness depends on the density of the fibers and is measured in terms of the pressure required for a steel ball to mark the wood to a certain depth. The harder the wood, the higher the pressure required. This does not refer to the actual hardness of the wood, but is a botanical term that distinguishes the wood of broad-leaved trees from that of conifers, which are considered softwood. Part right below the sapwood, in the core of the three. It is generally darker in color. An arrangement of wood strips creating repetitive symmetrical patterns. Grain in which the fibers put on for several years may slope in a right-handed direction, and then for a number of years the slope reverses to a left-handed direction, and later changes back to a right-handed pitch, and so on. Such wood is exceedingly difficult to split radically, though tangentially it may split fairly easily. Material manufactured by pressing resin-impregnated fibers or sheets, then applying a top layer of a higher quality product. The edge of a wood strip is originally cut at a right angle (90°). Just before the final sanding, the edge is cut at a 45° angle. When two strips are placed side-by-side, a small "V" shape is formed. This refers to all the shaping operations required before a strip is ready to sand and finish. Finishing system made of aluminum oxide and other Nanomaterials that are stabilized and bonded in a matrix. An assembly of wood strips in a square or rectangular pattern sometimes called a mosaic. The plain sawing method is the most common. It consists of sawing boards off the log in strips parallel to the pith. These boards are then sawn lengthwise again. Every board sawn this way has a unique appearance. Floors made with plain sawn boards have greater color and pattern variations than floors made with boards sawn using other methods. A board or panel made of multiple layers of wood glued cross-directionally for greater dimensional stability. A large molecule of chemically joined urethane units. Can be irreversibly solidified or "cured" using heat, light, or other techniques. Ready-to-install factory-finished flooring, compared to unfinished flooring, which requires on-site finishing. quarters. Boards are then sawn off the top parts of the faces of each quarter, cutting through the growth rings at about a 90 degree angle. This method usually produces fairly uniform boards with similar grain patterns*. * These patterns are created by the rings of the oak. The process of sanding a previously finished floor and applying a new finish. The ratio between the amount of water vapor in the air and the air's absorption capacity at a given temperature. Sanding a floor in order to remove the finish and restore the wood to its raw form. We distinguish between floors installed for residential and commercial use, especially for the warranty. A location is considered commercial if it is open to the public or is a place of work. A residential location is one where people live. In residential locations, floors wear more slowly. If we continue sawing boards off the faces of the quartered log, we get rift sawn boards, which are differentiated by the fact that the growth rings on the outer edge of the log are different from those nearer the pith. The grain on the top of the board will be linear, while the grain on the ends will be somewhat slanted. A log peeled in ultra-thin layers using a rotary saw (method generally used to make veneers). This cutting method requires soaking the wood in a solution to soften it before peeling, which can alter its natural color and open the wood grain, causing it to splinter. Polishing the surface of the wood. Part of the three right under the bark, it is generally lighter in color. 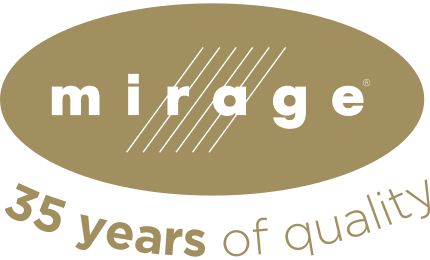 Mirage's name for its grade of wood with the most uniform natural coloration. The Select and Better grade have a lighter and more constant look than the other grades. Also see Grade. A wood block cut into thin sheets using a knife. This cutting method requires a presoaking process to soften the wood, which can alter its natural color and open the wood grain, causing it to splinter. A texture that offers a smooth and silky surface for timeless good looks. Strips made entirely of natural wood. Also see Classic. Solid hardwood (Mirage Classic) is composed of 100% hardwood, &frac34; inch (19 mm) thick. A specific variety of wood, like maple or oak. Some varieties include multiple species, such as red oak and white oak. The characteristics of a single species of wood can vary depending on the region. Oak grown in Nordic regions is harder than oak from the South. Characteristic of a material that does not react, or reacts only very slightly, to ambient variations such as relative humidity. A substance used to give wood a specific color. Figure on an edge-grain surface of wood, more visible on quarter sawn, with interlocked grain that is characterized by vertical bands of varying luster and vessel markings. Flooring boards to be installed in parallel rows, manufactured in various thicknesses and widths. Strips are connected with a tongue and groove joint. A floor base on which the floor covering is installed. A special kind of polyurethane cured using ultraviolet light. For some natural wood species, Mirage's Nanolinx finish provides UV Protection™ that slows and reduces the sunshading phenomenon that causes wood to darken and yellow over time. A solution that leaves a thin layer of protection on the wood after curing. Wood sawn into thin sheets and applied on a solid core to provide a real wood finish. Volatile organic compounds (VOCs) are carbon and hydrogen-based compounds found in gaseous form in the atmosphere. They can be produced by human activity (evaporation of organic solvents) or by natural phenomena (released by plants). Wood in which the fibers collectively take the form of waves or undulations. The surface of a wood strip, which can be resanded after wear to restore the floor's original appearance. Wear is generally very superficial. A 5/32"
(4 mm) thick wear layer is thick enough for many resandings.